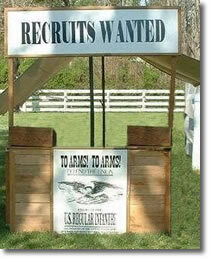 INTERESTED IN BECOMING A CIVIL WAR REENACTOR? Are you a Civil War History buff in the Northwest Missouri Region? Do you want an interesting, exciting and rewarding hobby? Have you ever considered Civil War Re-enacting? Perhaps you have read about it, or have even seen a Reenactment. Now come and Join Up, and experience it!!!. It's fun, it's educational and it's a once in a lifetime opportunity. To learn how you can be a part of all the fun and excitement, learn about American history, and have some really great times, then check out our recruiting depot below. If you are looking at this page, you might have been thinking about becoming a Civil War Reenactor, and joining a reenactment unit. You might still be looking for the right one, or perhaps you're thinking about it for the very first time. Well, hopefully, your search has ended. 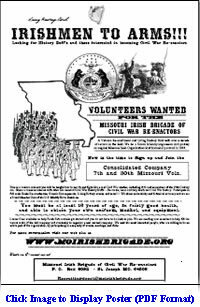 The Missouri Irish Brigade of Civil War Reenactors would like to invite you to join us in our pursuit of bringing the history of the Civil War to life. In the other pages of this site you will learn more about our identity but now you should be informed about the incredible hobby you are thinking about joining. You undoubtedly have an interest in history already. You’ve probably read countless books on the Civil War and visited some of the more well known battlefields. But your interest has led you to think about how to take your passion for history a step further. The answer is 'Living History'. The Art of Living History! As (Civil War era), Living History Reenactors, we are amateur historian's, and Civil War buffs, who are dedicated to the authentic portrayal of the common soldier during the American Civil War (1861-1865). As a Livinng Historians organization, our ranks are comprised of those who come from many different backgrounds, but who share a common interest in this period. We seek not only to remember, but also diligently try to experience life as it was first hand. All, in an attempt, to come to a greater understanding of our ancestors experiences. As Reenactors, we participates in a variety of civil war living history and reenacting events each year. We base our activities on first person accounts of day-to-day life in the 19th Century Army. We try to do everything that the soldiers did, no matter how mundane. By trying to put as much intricate detail of soldier’s life into our events, we feel we gain and can therefore communicate a greater understanding of the trials of the civil war soldier. Our reenactments include marches, ration issues, mail call, troop inspections, construction of winter quarters, and even the building of breastworks in the field. We always strive to improve our skills in the period Infantry drill and the manual of arms so that they become second nature to us, as it was to the soldiers of any period Civil War Infantry Company. There is great pride in being a Living Historian! But the most incredible aspect of this hobby is the connection that we make with the people of the past and the people who surround us today. We are able to touch that common human thread that we sometimes lose especially in these fast paced modern times. Once you become a member you join a close knit family. Friends become comrades. Brothers in Arms. You rely on one another and together you honor the memory of real life people that sacrificed all for their country and served over 140 years ago.. Contact us and let us know who you are, and that you are interested in becoming a Reenactor and you would like more information. The Recruiting officers will send you a recruiting packet if you wish, with a membership application enclosed. Feel free to get in touch with us, with any questions you might have about the unit and the hobby in general. Once you have made contact, we can arrange to give you a trial run in the field. We can put you in a uniform and get you up to speed in the school of the soldier (how to march and fight) and you'll see what we're are all about and what it's like to be a Civil War Soldier. Don't worry about accommodations, you'll be taken care of. All you have to do is show up and we'll make it our business to make sure that your visit to the Civil War is everything you imagined and more.